Underdeveloped ear canals can impact your child’s hearing, speech, language development, and learning abilities. Fortunately, Dr. John Reinisch, Dr. Youssef Tahiri along with their partner in Palo Alto, Dr. Joseph Roberson, offer comprehensive aural atresia repair at their Beverly Hills, CA, practice, which draws patients from around the world. In collaboration with Dr. Roberson, we can actually rebuild the inner ear, restoring near-complete hearing. The International Institute for Micotia Repair is the only practice that combines aural atresia repair and microtia treatment into a single outpatient surgery. In this way, we can minimize discomfort, recovery time, and expense. At the same time, if your child does not qualify for ear canal reconstruction, we can recommend an alternative treatment to improve your child’s hearing. The International Institute for Micotia Repair is the only practice that combines aural atresia repair and microtia treatment into a single outpatient surgery. If your child suffers from aural atresia, he or she may be a candidate for ear canal reconstruction. Dr. Reinisch and Dr. Tahiri will take a CT scan of the inner ear to make sure that he or she has a healthy cochlea, which is necessary for successful surgery. The majority of patients meet this requirement. 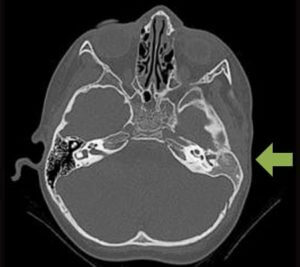 These images will also reveal whether the inner ear bones have fused together, another condition that will limit candidacy for surgical repair. Children must be at least two-and-a-half years old to receive a CT scan. Dr. Reinisch and Dr. Tahiri will consult with Dr. Robertson, as well as an audiologist and other specialists to determine your child’s eligibility for treatment. A trusted otologist (Dr. Roberson) will perform ear canal reconstruction, also known as canalplasty. Dr. Reinisch and Dr. Tahiri will perform the cosmetic aspects of the procedure, typically using a polyethylene MEDPOR® or OMNIPORE® implant to create an outer ear framework. Your treatment team will carefully plan the procedure during an initial consultation. The surgery itself will take place under general anesthesia. To ensure your child’s complete safety, we work with experienced pediatric anesthesiologists. Your child’s surgeon will first create an opening where the ear canal would normally be located. He or she will line this opening with a skin graft and, if necessary, reposition the inner ear bones to ensure better hearing. In some cases, the doctor may need to create a new eardrum as well, using an additional skin graft. Once this process is complete, Dr. Tahiri or Dr. Reinisch will reconstruct the outer ear, typically using the MEDPOR® or OMNIPORE® technique. 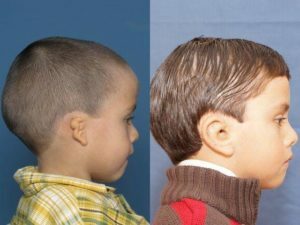 Combined Atresia Microtia (CAM) surgery is a rather extensive process. Though it is an outpatient surgery, we will still need to monitor your child’s progress and healing. In most cases, your little one will have the first follow-up one to two days after surgery. The second appointment will usually take place two weeks later. We know that many patients come from long distances to receive our care. We also partner with the local Ronald McDonald House to provide long-term housing.